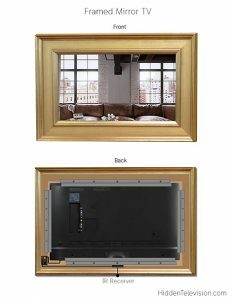 The Framed Mirror TV Kit upgrades your TV to a mirror TV. Choose from any of our elegant frame styles, and we will customize the design of the frame to fit it precisely. Our frames are built to the exact measurements of your particular TV, they slide over the screen and lock securely into place. As a result, installation is easy and the finished product fits perfectly. 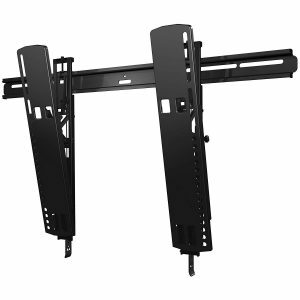 The SANUS VLT16 Super Slim tilting mount places 51″ – 80″ TVs just .82″ / 2.08 cm from the wall, yet still allows up to 10° of tilting capability. Due to our experience, we are able to ship most orders within 2-5 days. We offer Elite Expedited Service for an additional 5% on checkout. What is the overall size with the frame? 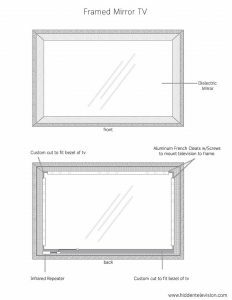 Yes, be sure to mention you’re doing a recessed build when ordering and we will build it without a backbuild frame as shown here When recessing a television, be sure to use an in-wall ventilation system. What is the advantage of buying the complete Samsung Mirror TV instead of the kit? Our Framed Mirror TV Kits literally takes minutes to install and once together are as easy to install as any regular TV and are beautiful pieces of functional art. A custom project where you just buy our glass will require hiring a woodworker or cabinetmaker to frame it up, which can be expensive, require more work on your part, and often takes more time before your mirror TV is ready for use. Once you have added your television to the kit, the TV installs on the wall exactly the same as regular TV. 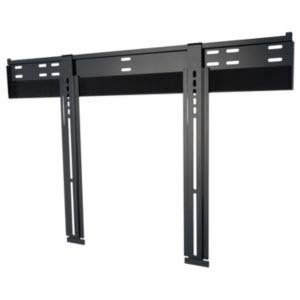 You just hang it on the wall with a slim profile wall mount and you’re all done! You may want to string the cables back through the wall for the best appearance. Alternatively, you can hide them with cable covers, which attach to the wall and can be painted to match it.